Motivation: Initially participants think of the Facebook group as a bonus, but every time I see it become a crucial part of their experience and success. Not only does the Facebook group allow me to answer your questions and provide support and education, but allows the group members to support and encourage each other and build a community around the changes you’re making. Emotional Eating – this is one of the biggest challenges I see my clients face so we’ll be diving into strategies to address emotional eating, especially during the evening hours! Eating Well for Life – what happens after the Reset is just as important as what happens during. I’ll be providing strategies and tools to help you turn these 28 days into a kick start for life long changes! What You Want to Know – The course looks slightly different each month as I curate it to the needs and interests of the group, I’ll be asking you what you’d like to know more about! What if I don’t have Facebook? Not a problem! The group has a member’s only website where you’ll be able to access all of the meal plans, check-ins & resources you need for the Reset. I’ll be traveling or have social commitments, can I still do this? Yes! The goal of the Reset is to set you up to eat well for life, so you’ll be provided with guidelines, templates and strategies to support your health goals while enjoying real life! Who is the Reset best for? Anyone who wants to improve their health, relationship with foods, increase their energy, lose weight or is just in a food funk and wants to add some delicious whole food recipes to their rotation. How much time will I need to spend meal prepping? The prep guide will help you with this, but typically 1-2 hours on the weekend and 30 mins a few times during the week. Are the groceries expensive? The food costs vary depending on how stocked your kitchen is. If you need to get all of the basics (oil, spices, etc.) I provide recommendations to keep costs down including Bulk shopping for spices and doubling the recipes you’re most excited about! Any recipes you don’t make will be there for after the Reset! Do I need special kitchen equipment? Just a blender, cutting board, knives and pots & pans! I’ve tried so may things, I’m not sure this will work for me.. I hear you! The program was created after working with hundreds of women and seeing what does and doesn’t work. It provides structure for those who prefer it but there’s lots of flexibility to make it fit your tastes & schedule. I’ll also be here supporting you throughout and focusing on progress over perfection! I have food allergies, will the program work for me? The Reset is gluten, dairy & sugar free - if you have other allergies you’ll be given an approved substitution list and I’m always here if you need ideas or help in adapting a recipe. Will I have to cook separate meals for my family? I’ve had lots of mommas successfully complete this program and find new family favourite recipes! Of course everyone has different tastes and ideas are given for tweaks and adjustments whether that’s bigger servings for larger appetites or simple ingredients for picky palettes. Can I do this if I’m vegetarian or vegan? You can but it requires a lot of tweaks. I run a 14 day plant based Reset a few times a year as well! Will I lose weight? I commonly see weight loss of 5-10lb during the Reset, I’ve also seen as much as 20lb! This really depends on your goals and I have a separate set of tips for those focused on weight loss and for those who just want to eat better without weight loss as a goal. 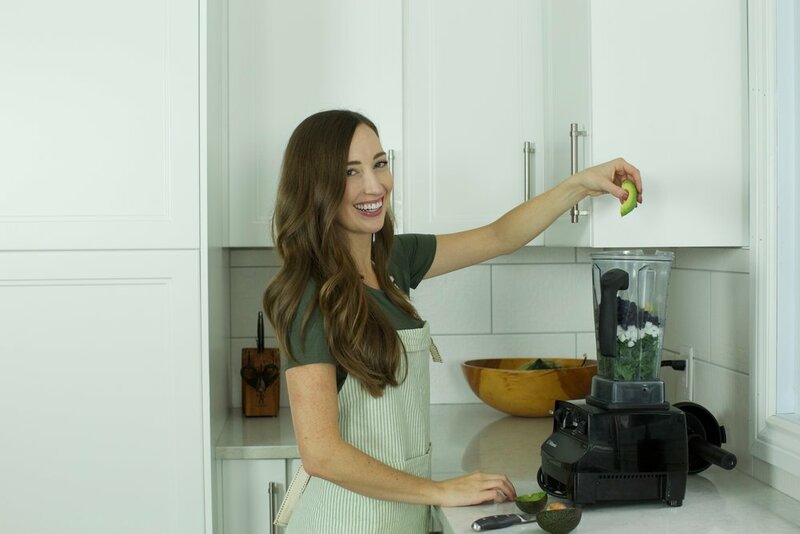 I’m a nutritionist with a passion for helping women change their eating habits, improve their relationship with food and incorporate meal prep into their busy lives. The world of nutrition can be overwhelming and contradictory. I'm here to help you sort fact from fiction and reach your health goals without counting calories or feeling deprived. I’ve seen hundreds of busy women transform their bodies, and more importantly they way they use and see food, with this program and am so excited to help you do the same. Ask away - I want to make sure this is the perfect fit for you and that you have no concerns or hesitations going into it!